The Eurasian wryneck (Jynx torquilla Linnaeus, 1758) belongs to the order of the Piciformes and to the family of the Picidae even if apparently it has really nothing that may remind these birds. It does not have a woodpecker ‘s beak and not even the strength these birds show to have in their particular tool and consequently is not capable to dig its own nest. It does not have a woodpecker’s tail, in fact it does not show any reinforcement in the calamus of the tail feathers, used by the picids in the typical support posture and, in proportion to the body size, a length much more accentuated than that of the woodpeckers. It does not climb the trunks and neither clings to them as usually do the woodpeckers when resting. It does not have the typical and usually well evident livery of a woodpecker but it is cryptic like a nocturnal bird and such to totally camouflage it to the sight when perched on a trunk. Finally, it does not have the wavy flight of a woodpecker, but quite rapid and straight and always along the ground. Concluding, this bird has really very few morphological links with the woodpecker. Two are the characteristics that bring it closer and assign it to this family, the zygodactylous fingers, first and fourth pointing backwards and second and third facing forward and the long sticky tongue. Not even the ancient nature observers had missed the particular characteristics of this strange bird, very common in the whole Mediterranean area and therefore known by the old civilizations and observed since ever. In old Greece popular superstition, the Eurasian wryneck was placed in a very important position because it was indicated as a good omen to backtrack a loved person who had gone away. The opportunity was given by the fact that they used to tie one leg of this small bird with a long thread that made it flutter around giving the illusion to be able to leave but always recoverable by pulling the cord. The term Jynx comes from the Greek “iuzo-iu” = cry, shriek of surprise, and “torquilla” from the Latin “torquere” = to twist, because of the characteristic and strange winding movement of the neck and of the head while emitting its song. And just this particular has been at the origin of the Italian common name as well as of others given by many other countries. In English Eurasian wryneck; in French Torcol; in Spanish Torcecuello; in German Wendehals; in Portuguese Torcicolo and in Italian Torcicollo. The Eurasian wryneck is typically Euro-Asian with a very vast areal covering practically the temperate and cold belts of the two continents. It is present in all Europe from the Mediterranean up to all the Scandinavian Peninsula, in continental Russia and along the central Asian and Siberian belt, up to Japan and part of China. In the United Kingdom is present only in Scotland. There is a diffused but isolated colony in northern Pakistan and Himalayan India. In Africa is present only along the Mediterranean coast of Morocco, Algeria and Tunisia. 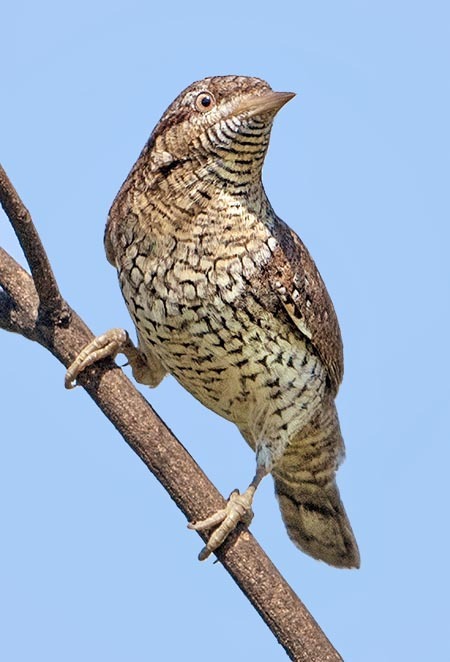 The Eurasian wryneck is a long range migrant that hibernates in the sub-Saharan belt, forthe European populations and in the Indian and Indochinese peninsulas for the Asian ones. The arrival in the nidification places occurs during the first months of spring and the departure for the winter quarters begins from August up to late September. The genus Jynx includes only two species, the Eurasian (Jynx torquilla) and the Red-throated wryneck (Jynx ruficollis) of sub-Saharan Africa. Conversely, 6 subspecies have been classified in all its areal. The characteristics recalled since the old times, are evidenced every time this bird enters the courting period. In fact, while emitting its monotonous and endless “kie kie kie kie” for calling the female, the male elongates and twists the neck in a particular way, so much to lead to imagine a complete turn of the head. A behaviour it adopts also when disturbed or surprided on the nest: it elongates the neck twisting it backwards in a rather strange position, turning the head towards the tail and erecting the feathers on the head, hissing and moving the body like a snake. Behaviour immediately coupled with the magic and demonized as bad omen in the old times of the Anglo Saxon world; so much to remind it in the saying still used to put a jynx on someone, just to wish a curse. This waving of the head is even more emphasized when the female, accepting the male invitation, duets with a well concerted low echo with its every call and gets close giving its consent to the union. 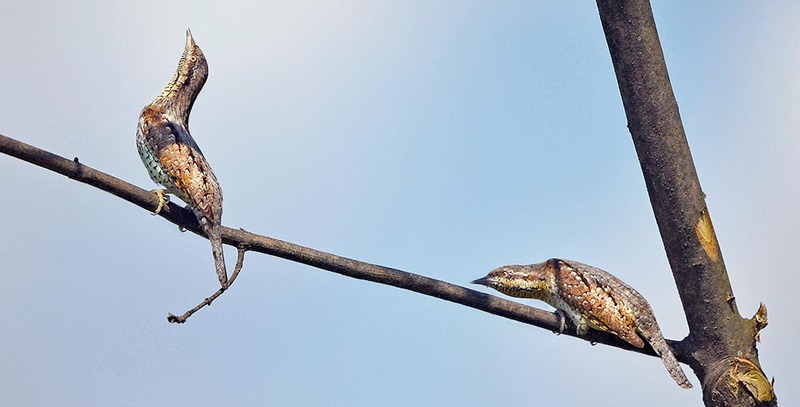 At this stage while the female assumes a lying horizontally position on the branch to which is resting, the male at its side stretches the body vertically like a dancing snake, after which the singing duel ends with the mating. The Eurasian wryneck nourishes mainly of ants and larvae it catches rummaging directly on the ground in the anthills. Rightly due to this reason the natural habitat of this bird is that linked to the presence of this peculiarity, therefore rather dry locations, open and sunny, large gardens and also city parks, orchards and bushy zones, open woods, but never densely treed. Essential is the presence of old trees where to find a shelter for their nest. 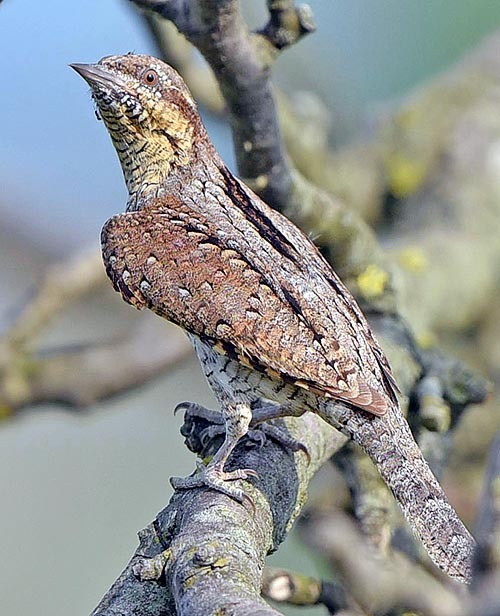 The covering livery of the Eurasian wryneck is the most imaginable camouflage. A mix of greys, browns and blacks forming unintelligible spots, stripes and nuances and perfectly similar to a piece of dry wood. On the back runs a not well defined black line that from the nape gets to the overtail and which further accentuates the camouflage. The tail is on the contrary finely and elegantly speckled with various tonalities of grey. This livery is comparable, roughly, to that of a Nightjar (Caprimulgus europaeus) or to a Scops owl (Otus scops). The lower part is slightly paler, with a greyish cream base speckled of small blackish spots and finely barred with slight black lines under the sides. At times in the male this speckling is slightly more accentuated and with bigger spots. This barring is similar to that of a Barred warbler (Sylvia nisoria) or, in a more emphasized way, to that of a Sparrowhawk (Accipiter nisus). The young have a livery much similar to the adults but with a milder and less distinct colouration. There is no evident sexual dimorphism. The beak of the Eurasian wryneck is thin, conical, very pointed but absolutely unsuitable for doing the typical work of the real woodpeckers. On the contrary, the tongue is fairly long, as it may reach the 10 cm, cylindrical, with very tiny scales arranged in the opposite direction to the length, and very sticky. It is a specialized tool to be introduced in small fissures for collecting ants, larvae and insects from anthills on the ground or under the bark of the trees. It has a length of 16 cm, a wingspan of 25 cm and a weight of about 25-30 g.
It nidifies in whatever available cavity, possibly in old trees but also in holes of the walls and occasionally in fissures on the ground. The den is used at the natural state without the input of any other material but laying directly on the available substratum. It makes it also in holes of old woodpecker nests and even more in the next boxes that seem to entice more and more these birds. When it takes possession of an artificial next box it does not fail to empty it totally of the contents making it absolutely uncluttered and without any substratum. It is a particularly laying bird not only for the quantity of eggs laid but also for the natural predisposition to lay again those possibly lost until to reach the prefixed number that usually is around eight-nine. In this connection, several experiments done right during the deposition, which envisaged daily and continuous withdrawals of one single egg, have caused an immediate redeposition of the missing egg to reach the number planned by the bird. It is unimaginable the total number of eggs laid during one of these experiments: a good 48. They say that the birds cannot count or at least do not know how many eggs they have laid until when they do not reach the number they have foreseen. No matter how strange is the fact, it is however easily verifiable with the domestic laying hens that are capable to lay even 300 eggs per year, and moreover, for the most part infertile. Their ancestress, the Red junglefowl (Gallus gallus) lays about six eggs then stops and begins hatching. So much would do our domestic hen that, once reached the ideal brooding of 12 eggs, would inevitable start to hatch. Also our Eurasian wryneck would do the same as soon reached the prefixed number for its brooding but the human hand has upset their math. The Eurasian wryneck is brave when on the nest and does not have any fear of possible intruders, probably aware of the mimetic capacity of its livery that actually nothing might do once trapped inside the cavity. During the inspections to which are periodically submitted the next boxes, often it does not move even when they are opened, remaining immobilized on the eggs or at times moving in the darkest corner and carrying out the strange behaviour previously described. The brood is remarkably short, typical of some woodpeckers, and lasts only 12 days and is done by both partners. The young get out from the nest after a fifteen days, initially climbing the trunk and the nearby branches, and keeping there till when able to fly. They usually do one yearly brood. The species is protected by the European Legislation.